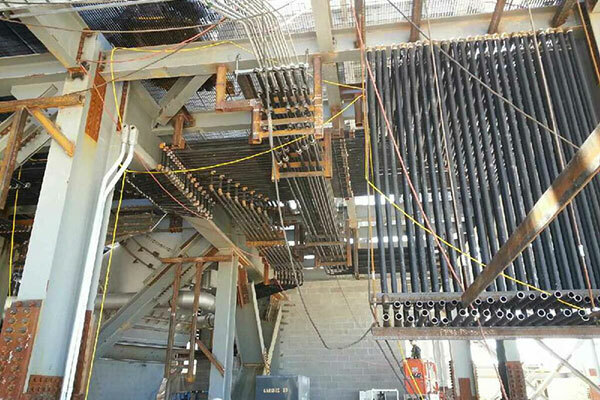 M&D Mechanical Contractors, Inc. has subcontracted from Turner Construction Company the fabrication and installation of all cooling water piping on the Mississippi Silicon project in Burnsville, Mississippi. This fast-track project is the first new silicon metal production facility to be built in the United States in the last forty years. M&D’s role is to shop-fabricate all Owner-furnished cooling water piping components, including supports, and deliver to the jobsite for installation. Pipe sizes range from 24” at the cooling tower and pump house to approximately 39,000 feet of 1-1/2” piping to the submerged arc furnaces. All piping dimensions are field-verified prior to the production of piping and support drawings by our in-house CAD department and subsequent release to the pipe shop for fabrication. This is an extremely challenging project due to the compressed schedule, the relatively tight working conditions and the coordination required among the other contractors and trades people. For more information about Mississippi Silicon, visit the company site at www.missilicon.com.